In the previous parts to this series we began our journey to migrate from Exchange 2007 to Exchange 2013, and completed the sizing of our new environment, finishing with getting the hardware ready to roll. We'll now focus on getting ready to deploy Exchange by first ensuring issues within the current environment are corrected, and then install Exchange 2013 pre-requisites. While a bit of a mouthful, pre-deployment remediation could be explained better as "things we need to sort out before we install Exchange". We'll explain some of these below. As we've mentioned before, you must patch Exchange 2007 to the very latest Service Pack and Update Rollup before you attempt to do anything with Exchange 2013. As with all patches, ensure you read the release notes before implementation. If you've got any Mailbox Databases that look like the example shown below, you'll need to make sure they've got the current default Offline Address Book for your organization hard configured against each database. This is because Exchange 2013 will install a new default Offline Address Book, forcing clients that don't have this value configured to perform a full Offline Address Book download before we're actually ready to introduce Exchange 2013 to clients. You can correct this against the individual database by selecting the default Offline Address Book by choosing Browse in the Client Settings tab in the window shown above. 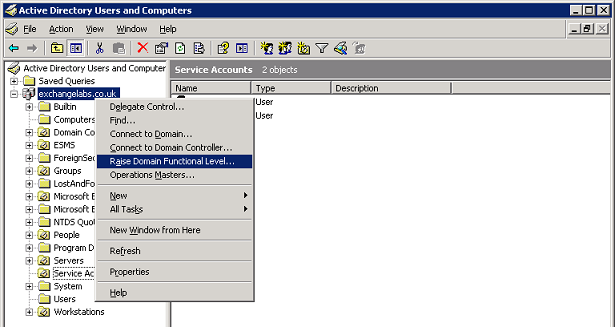 If you haven't already, you'll need to raise the forest and domain functional levels of your Active Directory to a minimum of Windows 2003 for both. Exchange 2007's minimum forest and domain functional levels are just Windows 2000 - so it's reasonable to expect you might need to raise this. Before you do so, make sure you ensure your Active Directory is in good health (for example by using dcdiag), backed up and any Windows 2000 Domain Controllers are gone and were correctly removed. In part three and part four of this series we looked at the methods available to identify existing clients, and if you haven't updated clients now is the time to do so. AutoDiscover responses from Exchange 2013 contain new methods to support internal Outlook Anywhere, and these updates ensure support for this in addition to other fixes. Naturally if you can update clients to Outlook 2013, that's even better as your users will be able to benefit from new features, such as Apps for OWA and Outlook 2013; otherwise use tools like Windows Server Update Services (as mentioned in part four of this series) to ensure clients meet minimum update levels or higher. 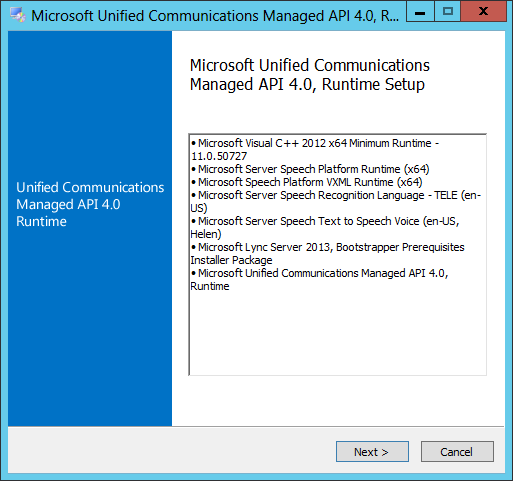 With the recent release of Outlook 2010 Service Pack 2, there's even more reason to get clients updated. If your client discovery identified any clients that aren't supported with Exchange 2013, then you'll need to start replacing these now. Remember - Outlook 2003 and below aren't supported so if you're using this within your organization upgrade these clients to at least the above versions of Outlook before we start the upgrade. If you've not enabled Outlook Anywhere already, you certainly will want to consider enabling it for Exchange 2007 at this point to smooth migration and coexistence. 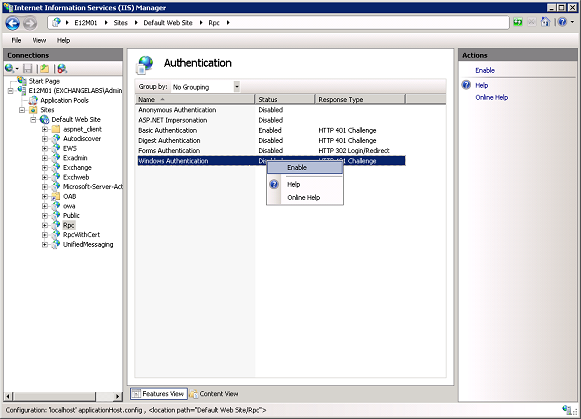 If you've already enabled Outlook Anywhere and used Basic authentication then you'll also need to make another change on Exchange 2007 Client Access Servers, within the IIS configuration. Exchange 2013 can accept Outlook Anywhere connections for Exchange 2007 mailboxes, but it will proxy connections to Outlook Anywhere running on the Exchange 2007 Client Access Servers. If Basic Authentication is in use, it will also need Windows Authentication enabled to allow Exchange 2013 to pass authenticated requests on. As well as upgrading Microsoft software to support Exchange 2013, we'll also need to upgrade third-party software to support the product too. In our example organization, we know we've got to upgrade our BES Server, so we'll ensure the pre-requisites are fulfilled in advance. The key to ensuring that you receive support from the third party vendor during your upgrade is to ensure that if a change needs to be made before you implement Exchange 2013, you follow those steps as per the third party vendor's requirements. We're finally ready to begin the installation of pre-requisites for Exchange Server 2013, after what must seem like a lot of preparation. However that preparation should be worthwhile as we'll now expect the installation to progress pretty smoothly. 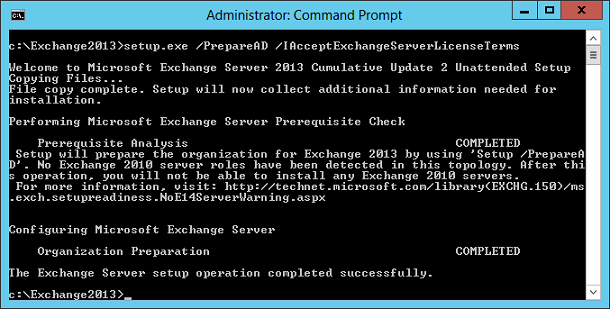 We'll be installing Exchange onto Windows Server 2012. If you're given the choice between Server 2012 and 2008 R2 SP1 the former does ensure that less pre-requisites are required, and even Standard Edition supports Clustering (and thus the ability to smoothly upgrade to a Database Availability Group at a later date). In the previous part of this series we defined the specifications for our server, E15M01 and created the supporting virtual machine. After installation of the above, our server has the required pre-requisites needed before we can install Exchange, and as we'll see next, prepare Active Directory for Exchange 2013. Before installing Exchange itself, we'll also need to prepare Active Directory. Strictly speaking this will be performed automatically if we simply run the Exchange setup; however downloading and unpacking the Exchange setup files ensures we've got pre-requisites available for JetStress testing; and because the Exchange 2013 Schema update is an irreversible change that may cause large amounts of Active Directory replication, we'll perform the Active Directory prep separately. First we need the Exchange 2013 installation files. The latest Exchange 2013 Cumulative Update is always the installation source you should use for installation. This is firstly because the update is actually a slipstreamed installer which includes all files required for initial installation; and secondly because installing the RTM version of Exchange 2013 into an Exchange 2007 environment is not supported. The Cumulative Update is the same download for all customers - whether it's a trial, TechNet or MSDN subscription, retail licence or volume licence code. Before we continue and implement the schema updates let's stress something important again - the Schema Update to Active Directory is an irreversible change. You cannot uninstall it, or delete the changes it makes. If you need to revert back to an earlier point in time, you would need to roll-back your Active Directory environment - no simple task. Therefore before you continue, make sure you're confident that you are happy to continue. You may want to perform a health check against your existing Active Directory environment and before the point of implementing the changes we'll make, perform a full backup of Active Directory. There's one other Exchange related consideration to be aware of - once these changes are in place, we can't install any Exchange 2010 servers into the environment. If you've skipped to this part in the series because you just want to get to the good stuff, bear this in mind; if you find you've got incompatible clients or applications and need to upgrade to Exchange 2010 instead performing Exchange 2013 Active Directory prep will prevent you from being able to install an Exchange 2010 server. If you think you might need to install an Exchange 2010 server at a later date, then there is a workaround. We can first of all download and extract the Exchange 2010 SP3 setup files and perform the Schema, Active Directory and Domain preparation for Exchange 2010 first, then carry on and implement the below steps for Exchange 2013. 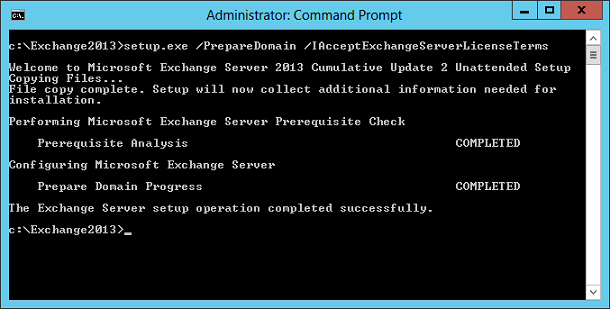 If you need an Exchange 2010 server later, you'll be able to install one. After reading the hard-hitting section above you might be worried about running the schema preparation. Well, don't worry too much because once you've protected yourself against anything possibly going wrong, running the schema preparation is actually very simply. The schema update should then proceed - and usually takes between 5 and 15 minutes to execute successfully. Long term Exchange admins will recognise the command from previous versions - and no, using setup.exe rather than setup.com isn't a mistake. What you'll notice is new is the mouthful of a parameter /IAcceptExchangeServerLicenseTerms which you'll now need to confirm each time you execute setup.exe from the command line. You'll notice at this point you'll see confirmation (as mentioned above) that once this step has completed no Exchange 2010 servers can be installed; so heed that warning if you think you may in fact need one. Our final preparation step is to prepare the domains. Exchange is installed into a Forest rather than a domain and we must ensure that each domain that hosts any sort of Exchange object - be that contacts, mailboxes, distribution groups or Exchange Server - is properly prepared. For many organizations this means all domains. If you've got multiple domains within the same forest, you might want to consider running the command with the switch /PrepareAllDomains to ensure all domains within the forest are properly prepared. This will save you the effort of manually executing the command from a server and login within each domain one by one. In this part in the series we've performed two major steps - we've ensured that before introducing any aspect of Exchange 2013 into the environment we've made sure any necessary work to bring our organization to a supported level has been completed. Finally we've prepared our new Exchange 2013 server by installing the pre-requisites for installation, and finally prepared Active Directory so that it's ready for Exchange install. In the next part in this series, we'll get our storage ready for Exchange and begin testing to ensure it meets requirements.